Banking as we know it may soon be dead. Long live super-banking. Today, the genius of technology is surrounding this space, and the future may already be here. Banks are scared, and they should be. They’ve forgotten that the customer is king, and that this is a digital era where innovative new fintech companies have them surrounded. Digital and mobile payment platforms are replacing traditional banks and credit card systems. Welcome to the banking model reboot, and one company that is ready to roll out the super-bank model of the century: One that will serve millions of ordinary customers by listening, by making it super-easy to pay your utility bills, send and receive money and even buy and sell cryptocurrencies. And the company behind the super-bank evolution is QPAGOS (OTCQB: QPAG). QPAGOS is already working with giants in the telecommunications and tech industries: That includes AT&T, Xbox, Apple, Virgin Mobile, Nextel--and 150 others. And it’s ready to latch on to the opportunity to try to capture another 400 million customers over the next few years. The company plans to roll out tens of thousands of self-service kiosks in the U.S. and if that sounds wild, it is—but it’s not wildly expensive. QPAGOS’ plan to capture the evolution of banking comes at a ridiculously low price tag compared to traditional banking. Not only do Super-Banks operate at a fraction of the cost, they have more profit potential because of the fee structure that collects on a wider spectrum of services. So far, QPAGOS has been seeing double-digit quarter-on-quarter revenue and earnings growth for four straight years. Now comes the big push … and while traditional banks are busy shuttering thousands of branches in the suburbs and out-backs, this Super-Bank is preparing its major breakout. Consider this: they’ve already got 700 self-service banking kiosks up and running. The next phase is 1,000 new kiosks, and they’re planning 10,000 over the next few years. The future of banking is here. Don’t be late to the game. QPAGOS has already stormed Mexico, now it’s coming to the U.S.
QPAGOS has positioned itself as one of Mexico's pre-eminent providers of cutting-edge digital payment services for both consumers, merchants and services providers. The company’s payment ecosystem is huge. It boasts a massive network of self-service banking kiosks, point-of-sale terminals and mobile apps that connect merchants and consumers with more than 150 service providers across multiple devices. It’s even got a proprietary electronic wallet--Monedero—which lets users deposit cash for future top-ups or mobile app purchases. It’s established in Mexico, where it is one of the pre-eminent providers of cutting edge digital payment services. And it’s a household name on all fronts: consumers, merchants and service providers. Mexico has been a gold mine, with 60 percent of its population not using banks and 95 percent of consumer purchases being made in cash. Enter QPAGOS with a digital solution that met everyone’s needs. Mexico was the springboard. And it was a wild success. What has come since then is global. And its payment solutions have already been successfully deployed across continents, including South America, North America and Europe. And it’s all about revenue. In this case, it’s about combining the massive revenue of banks, online payment processors and mobile payment solutions. It’s also launched a charm offensive targeting the lucrative international remittances market. 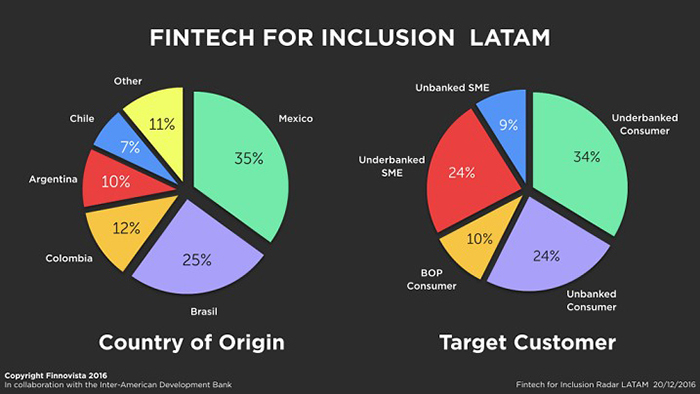 The company has begun rolling out a huge network of self-service banks along the U.S.(California)- Latin America corridor to facilitate cross-border money transfer and payments. And it’s planning to deploy 1,000 self-service kiosk in California in Phase 1 and rapidly ramp up to 10,000 self-service banks over the next few years. and 10 percent means a massive $2.8 billion revenue opportunity for QPAGOS. As the company continues to rapidly scale up, its addressable markets and revenues are expected to grow in tandem. 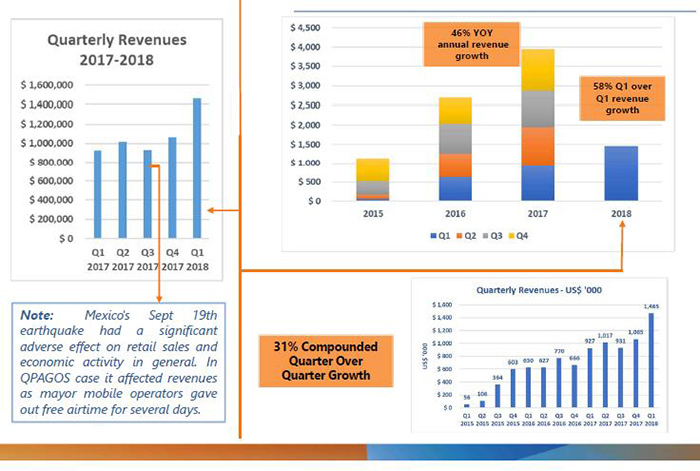 This should provide it with excellent growth runways that are likely to help the company exceed its already robust revenue growth clip of 58 percent Year-over-Year and 37 percent Quarter-over-Quarter (posted during the first quarter of 2018). Capturing the global banking market right now is about two things: inclusion and self-service. That’s why traditional banks are way behind. Until now, QPAGOS has mainly targeted Mexico, where low credit card and ecommerce penetration and a high cash usage have created a huge market for this product. In Mexico, only 2 percent of the country’s $200-bilion annual retails sales are transacted through credit cards. The unbanked world is much like the USA was in 1950. Inefficiency has ruled the day. Long queues, high banking/payment fees and low cash-machine coverage are all the hallmarks of the banking industry in these countries. QPAGOS noticed these glaring inefficiencies and responded, seeking to bring a super-bank kiosk to every street corner. Then they added pre-paid payments, loans, remittance... and even cryptocurrencies like Bitcoin (which most banks won't touch). Now, in Mexico, they’re targeting a market with 6 billion cashless transactions a year, and have started reaping the rewards. - Intuitive, easy-to-use touchscreens that not only allow direct interaction with customers but also generate new leads which allows QPAGOS to cross-sell its multiple services to users. - Tailored payment solutions easily adapted to different customer needs housed in highly secure data centers and designed for rapid deployment. - A vendor agnostic system, which means they can be delivered through a wide range of hardware devices including its self-service banks, mobile devices, POS devices and PCs. 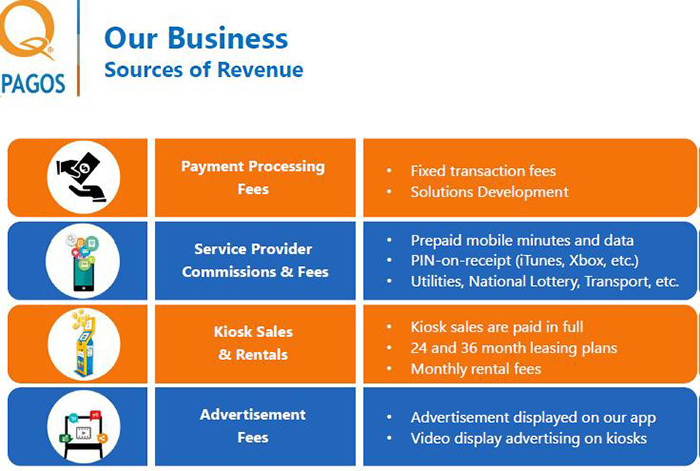 - Proprietary payment solutions that aren’t just cheaper, but they offer wider geographical coverage depending on mobile connectivity. This is how you capture a market: with flexibility. In fact, it’s all so flexible that it’s ideal for everyone from retailers who want to decongest teller lines and agent networks of independent businesses with high customer traffic … to banks and financial intermediaries who want to extend their geographical collection points. 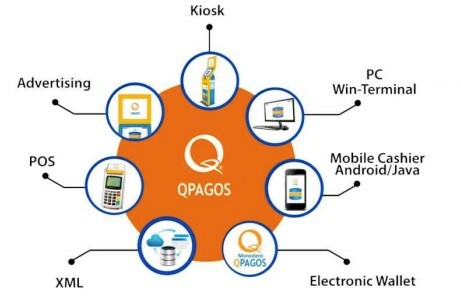 Or even a wide range of electronic payment distributors who would like to use QPAGOS' self-service banking kiosks to reach customers. The beauty of it all is that QPAGOS is likely to hit the ground running once it embarks on rolling out self-service banking kiosks across the United States. 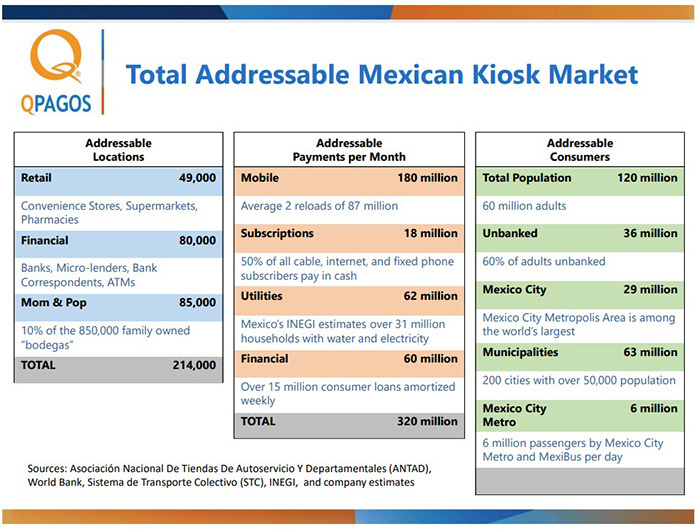 Behind these super-bank kiosks is an entire ecosystem of service providers including heavy-hitters like AT&T, Facebook, Dish, Sky, Movistar, Maxcom, Nextel, Telcel, Infonavit, Telmex, Izzi, CFE, Gas Natural, Pronosticos and other mainstream service providers, Mexican government agencies, mortgage providers and consumer agencies. 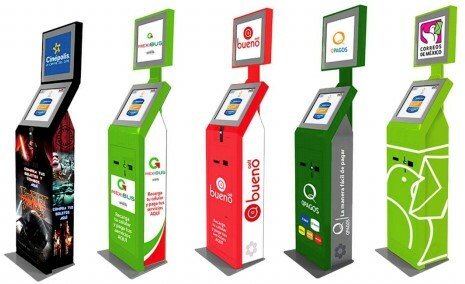 Again, the U.S. rollout is going to see 1,000 new kiosks along the California-Latin America corridor, and a whopping 10,000 in the next few years. Boasting considerable technology and contractual moats, QPAGOS is set to expand and defend its position in the cash2digital payments industry. It’s contractual agreement moat is equally impressive. 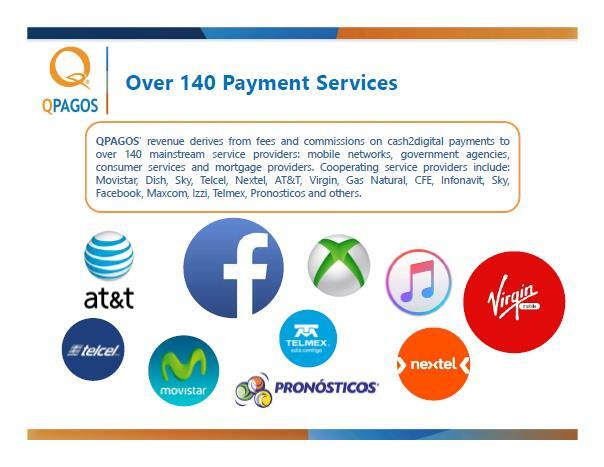 QPAGOS has already signed up more than 140 mainstream service providers to its platform including ATT, Xbox and cell phone providers Telcel, Telmex, Virgin Mobile, Nextel as well as other large providers that serve millions of Mexicans. Now they can focus on the business of rolling out super bank kiosks in the U.S. Led by CEO and Chairman Gastón Pereira, QPAGOS is trouncing the future of banking. Pereira, formerly of Citibank, has over three decades of experience in financial services, cross border payments and telecommunications in all the right geographies: U.S. Europe and Latin America. In this sector, he’s a groundbreaker, and when it comes to digital consumer financial products and services, he’s a pioneer. Nobody knows Latin America remittances like Pereira, and this will be one of QPAGOS biggest expansion areas. It helps, too, that Director James W. Fuller, a former senior VP of the New York Stock Exchange (NYSE) is on board, along with Andrey Novikov, a figure synonymous with global innovative payment services. Mogo Finance Technology Inc. (TSX:MOGO): This is a new spin on unsecured credit, which is a burgeoning sub-segment of FinTech. Providing loan management, the ability to track spending, stress-free mortgages, and even credit score tracking, Mogo is at the forefront of an online movement to assist users with their financial needs. Mogo’s software analyzes borrowers instantly and greatly reduces the traditionally cumbersome underwriting process for loans. It’s online only, so there’s very low overhead and a ton of cash to spend on marketing. Labeled as “the Uber of finance ” by CNBC, Mogo is definitely turning heads. With increasing membership growth and revenue lines continuing to improve, and a platform which many banks have failed to offer, Mogo could well become an acquisition target in the near future. EXFO Inc (TSX:EXF): EXFO isn’t new to the Canadian tech sector. The company was founded in 1985 in Quebec City, and its original products were portable testing products for optical networks. Since then, the company has acquired and build 3G, LTE, protocol, copper/xDSL, IMS, and VoIP test and service assurance products. Recent developments from EXFO are promising for long term growth potential. The new baseband unit emulation technology which is sure to be adopted on a large scale, as the tech offers operators a reduction of costs and a faster revenue stream. EXFO Inc is a model in the telecommunications industry, and a key player in the new wave of technology revolutionizing the finance sector. Power Financial Corp (TSX:PWF): Montreal-based Power Financial Corp has been in the finance industry since 1984. The company operates in three segments: Lifeco, IGM and Pargesa Holding SA (Pargesa). And, with its holdings in a diversified portfolio spanning the United States and Europe, Power Financial is a leader in its field. Focusing its investments in the emerging FinTech industry, Power Financial stands to benefit by riding this wave into the future. The company’s forward-thinking attitude and liberal approach to technology is sure to leave investors satisfied. The Descartes Systems Group Inc. (TSX: DSG) (commonly referred to as Descartes) is a Canadian multinational technology company specializing in logistics software, supply chain management software, and cloud-based services for logistics businesses. The company is making waves in the tech industry with its futuristic products and visionary leadership. As a key stock in Canada’s tech boom, and with its reach throughout numerous industries, Descartes Systems is a smart choice for investors. Computer Modelling Group (TSX:CMG) is a software technology company producing reservoir simulation software for critical infrastructure. Computer Modeling Group LTD. Is a tempting trade for investors as it brings together two essential industries - tech and resources- which aren’t going anywhere any time soon. Especially as the need for security grows, a tech company involved in the oil and gas industry has an incredible opportunity to offer other services. While Computer Modelling Group focuses on the resource industry, its technology is definitely breaking ground. Founded nearly 40 years ago by Khalid Aziz, a renowned simulation developer, the company has proven that it has staying power. As the resource industry meets technology, this will be a stock to pay attention to. PAID ADVERTISEMENT. This communication is a paid advertisement. Safehaven.com, Advanced Media Solutions Ltd, and their owners, managers, employees, and assigns (collectively “the Publisher”) is often paid by one or more of the profiled companies or a third party to disseminate these types of communications. In this case, the Publisher has been compensated by a third party shareholder to conduct investor awareness advertising and marketing for QPAGOS. The third party shareholder paid the Publisher sixty six thousand six hundred and sixty six US dollars per article to produce and disseminate six articles and certain banner ads over an approximately six-month period. This compensation should be viewed as a major conflict with our ability to be unbiased. Readers should beware that the third party shareholder, other third parties, profiled companies, and/or their affiliates may liquidate shares of the profiled companies at any time, including at or near the time you receive this communication, which has the potential to hurt share prices. Frequently companies profiled in our articles experience a large increase in volume and share price during the course of investor awareness marketing, which often ends as soon as the investor awareness marketing ceases. The investor awareness marketing may be as brief as one day, after which a large decrease in volume and share price may likely occur. This communication is not, and should not be construed to be, an offer to sell or a solicitation of an offer to buy any security. Neither this communication nor the Publisher purport to provide a complete analysis of any company or its financial position. The Publisher is not, and does not purport to be, a broker-dealer or registered investment adviser. This communication is not, and should not be construed to be, personalized investment advice directed to or appropriate for any particular investor. Any investment should be made only after consulting a professional investment advisor and only after reviewing the financial statements and other pertinent corporate information about the company. Further, readers are advised to read and carefully consider the Risk Factors identified and discussed in the advertised company’s SEC and/or other government filings. Investing in securities, particularly microcap securities, is speculative and carries a high degree of risk. Past performance does not guarantee future results. This communication is based on information generally available to the public and does not contain any material, non-public information. The information on which it is based is believed to be reliable. Nevertheless, the Publisher cannot guarantee the accuracy or completeness of the information. SHARE OWNERSHIP. The owner of Safehaven.com owns shares and/or stock options of the featured companies and therefore has an additional incentive to see the featured companies’ stock perform well. The owner of Safehaven.com will not notify the market when it decides to buy or sell shares of this issuer in the market. The owner of Safehaven.com will be buying and selling shares of the featured company for its own profit. This is why we stress that you conduct extensive due diligence as well as seek the advice of your financial advisor or a registered broker-dealer before investing in any securities. FORWARD LOOKING STATEMENTS. This publication contains forward-looking statements, including statements regarding expected continual growth of the featured companies and/or industry. The publisher notes that statements contained herein that look forward in time, which include everything other than historical information, involve risks and uncertainties that may affect the companies’ actual results of operations. Factors that could cause actual results to differ include, but are not limited to, changing governmental laws and policies, the success of the companies’ technology, the size and growth of the market for the companies’ products and services, the companies’ ability to fund their capital requirements in the near term and long term, pricing pressures, etc.